Gorgeous...I'm always captured by those who make their own sausages, cure meats, etc...an art. Nice! Living here in Austin, I've got lots to choose from, but my recent acquisition of a house(that has a decent-size kitchen), a smoker, a copy of 'Charcuterie', some pork belly to make bacon with, makes me think I can make some sausage too! Peter - thanks! It is definitely a fun hobby. Frank - definitely give sausage-making a try. And good luck with the bacon! blimey, these look awesome! great job. I have to try making sausage. just curious, what size WSM did you get? I'm looking to pick one up, but not sure if I should get the bigger model. Mostly cooking for small (i.e. less than 10) groups. Matt - thanks! Sausage-making is surprisingly easy, and well worth the effort. Rhea - we have the 18 1/2 inch smoker and it has been plenty big enough for us. We've done three good-sized slabs of ribs on it at one time. these look amazing! we just started making our own sausage and now i'm hooked. i'll have to remember this one when i bust out the casings again. Wow those look incredible! Even more impressive that you started from whole slabs of meat. I have friends out in Austin so will definitely have to make a trip out to Lockhart the next time I'm out there! Hi Marc - definitely don't miss Lockhart. It is a true beef barbecue heaven. Where do you get your wood in San Diego? I've seen you guys mention pecan and many other woods. I live in the area and want to expand my options. Great blog, by the way. Keep it up. Hi Andy, Unfortunately we haven't found any locally grown options for smoke wood, so I purchase most of it from Barbeques Galore on Clairemont Mesa Blvd. It's not cheap, but they have a good selection (Pecan, Alder, Apple, Oak, Cherry, etc). And recently I've found that Siesel's Meats (just off Morena Blvd.) carries nice Apple and Oak chunks. This is a great blog, thank you for posting everything! I have a Kitchen Aid mixer with grinding attachment and it seems to clog a lot. My meat never looks like that when it comes through. I do a pretty good job of cutting out the connective tissue, etc. but it still clogs. 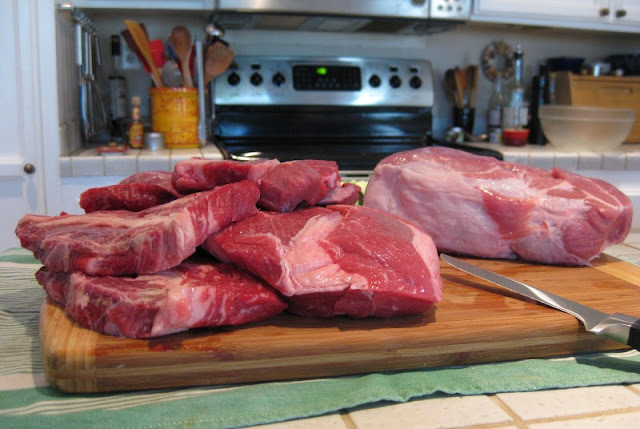 Do you refrigerate or lightly freeze your meat before grinding? Also, do you season the meat before or after grinding? I've heard arguments for both ways. Hi Cameron, Glad you enjoy the blog. I don't freeze the meat before grinding, but I do make sure it's kept cold (back into the refrigerator between steps). I haven't really had trouble with clogging, although really lean meats can give me a really fine, wet, messy grind (I try to avoid really lean meats!). One thing that has helped is the shape of the chunks prior to grinding: I cut the meat into finger-sized pieces -- about 2 to 3 inches long and 3/4 inch thick. As for seasoning, I've done both - before and after. I think I prefer doing it before, but it depends on if we're making more than one type of sausage from a batch of ground meat. If so, I do it after grinding. Thank you for the response. 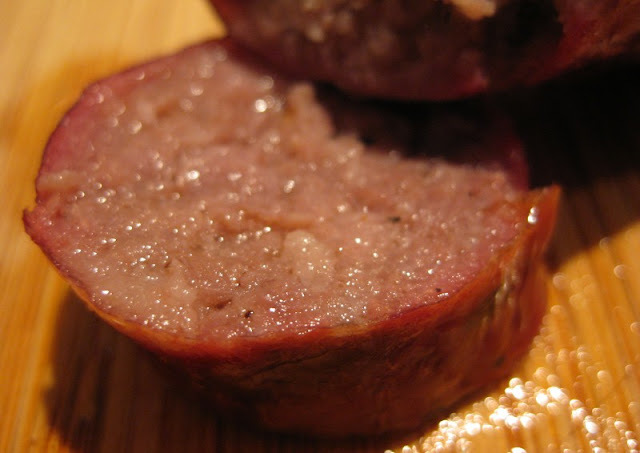 I made 8#'s of venison sausage last night and it turned out better than any I have made before. I cut the meat into thin strips, as you suggested, and cooled the meat in the fridge before grinding. I also let the venison dry on a baking rack in the fridge for 24 hours prior to slicing. It got a lot of the blood out and made the meat less mushy when it came out of the grinder. After slicing the meat, I put it all in a large bowl and seasoned it before placing it back in the fridge to cool back down. 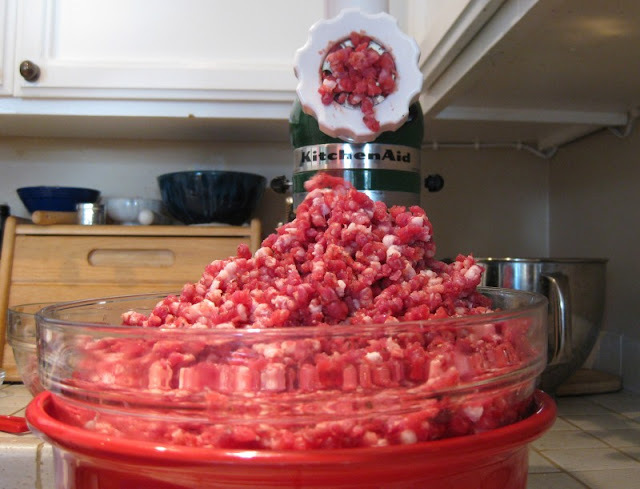 This way I did not have to season the ground meat and risk turning it into mush. Thanks for all of your advice on the blog! Do you have any homemade hotdog recipe? Depends what you mean by "hot dog". 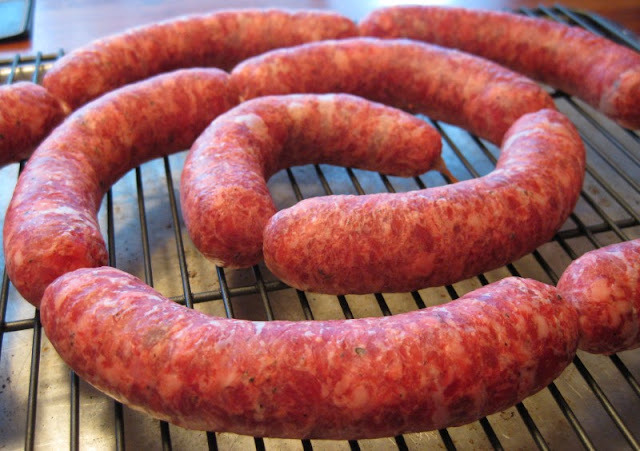 We've been playing with making our own bratwurst (both smoked and unsmoked) with some success. We haven't finalized a recipe yet, though. We have tried BBQ at many places in Texas. The Salt Lick in Driftwood and Round Rock are our favorites. We love their sausage. Any thoughts on spicing? 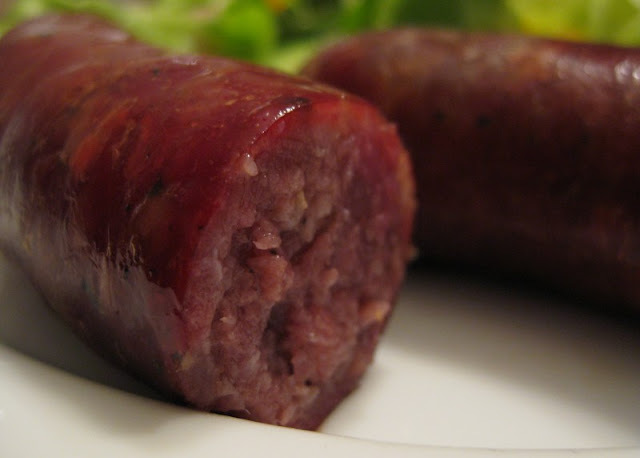 In Lockhart I loved Smittys Market for the purity of the sausage while Kreuz had a more nuanced tang as if there had been some sage or other earthy spice added. We've only tried what we described above - salt, black pepper and a bit of cayenne. Wow this is fantastic looking! Thanks. what ratio of salt to black pepper did you use per pound of meat? when you say a bit of cayenne, do you have a set recipe? Or do you play it by ear with the spices? Thanks jlondon! We don't have a set recipe, but as a general rule I use a little over 1 teaspoon of kosher salt per pound of meat (that's about 6 or 7 grams) and a little less than 1 teaspoon of cracked black pepper per pound. These sausages get most of their kick from the pepper, so it really is just a bit of cayenne (eg only 1/2 teaspoon in a 7 pound batch). We use natural hog casings that we get from our local butcher. If you can't find a local source, you can get them online at Butcher & Packer. 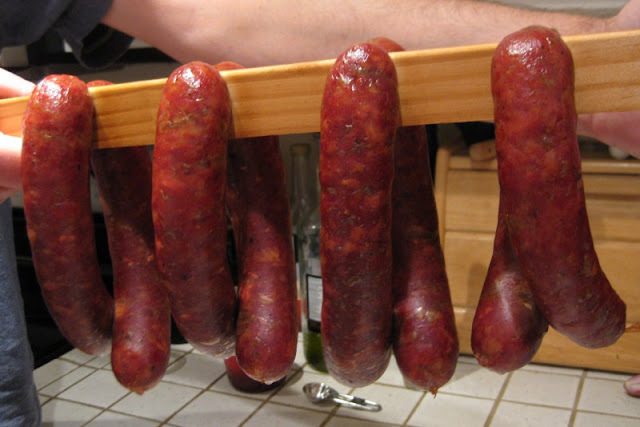 a litte late as a response but Smittys and Kreuzs use the same recipe for sausage. In taste tests, no one could tell them apart. Also you would want to use Post Oak for the main BBQ Belt flavor, Saltlick uses live oak but that is why the mostly just tourists go there. Did you smoke these on a WSM. Do you have better measurements instead of percentages. How much of each of the spices. I had great results with this. However how do I improve the texture. As I cut the sausage it does not hold together very well. And how do I get a more even smoke color. I get a smoke ring but it is very in the middle. Hi Kevin, Glad you tried this out. It's been a while since we've done it - we'll have to do it again soon! As for your issues, any number of things can cause a crumbly sausage, but not having enough fat in the mix, or not keeping the meat cold enough while mixing are both frequent contributors to a lack of integrity. Smoke rings are just that: rings. Typically you'll get a pink edging just under the outer surface that can be quite a contrast from the rest of the meat. This is normal and I don't think there's any thing to be done about it.